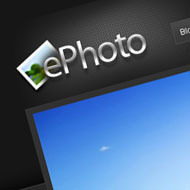 I have finished a new theme today titled ePhoto. You can view the live demo and features page for more details. This is a photography theme, but can certainly be used to showcase other digital imagery as well. The idea behind this theme was to give the photos themselves to most prominence. I tried to keep the layout clear and simple while at the same time spicing things up a bit with jQuery effects. The theme comes with three widgetized areas. The footer, where the Featured, Random and Rated images are being displayed is widget ready. You can remove each of the featured, random and rated photo displays individually via the Theme Options Page to make room for footer widgets. Both the sidebar on the homepage (where the about me box is) as well as the sidebar on post/index pages are also widgetized. With this theme I made sure to include the ability to create a blog section that is separate from the photos display. 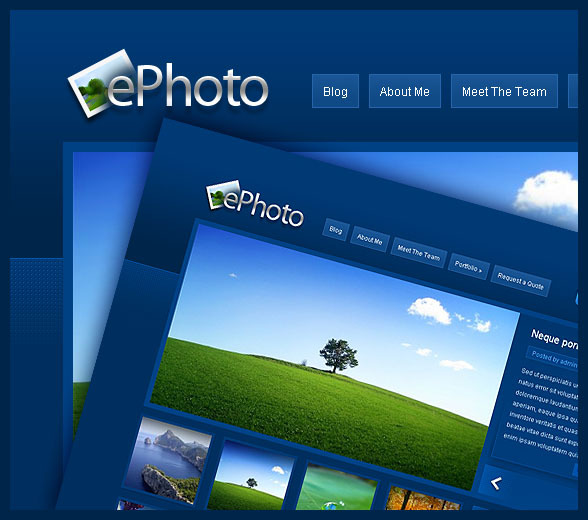 Creating your blog and adding it to the theme is easy, and is handled through the ePhoto Theme Options page. Just create a category called “Blog,” enable the Blog navigation link in the options page and you’re all set. Any posts added to the blog category are removed from the photo pages. The blog section and blog posts have been customized with a more blog-oriented layout, focusing on content rather than the images. When displaying imagery it is usually best to have a neutral colored layout. For this reason I didn’t focus much an creating additional color schemes, as I assume most people would want to use the Black version. However, I have included a blue variation just in case! The theme comes with all the standard features that frequent my collection. I have also integrated the upgraded theme options page from eBusiness to insure a userfriendly experience. That about sums it up. I hope everyone is doing well! On a side-note, I am looking to hire someone with css/xhtml/php/wordpress experience to help me out in the forums. If you are interested be sure to send me an email. One of my main goals in the coming months will be to improve forum responds time and create more in-depth theme documentation and tutorials. Getting some more people on board is the first step! its a long wait and now comes a new photo themes. Wonderfull and this is what l was looking for after nice holiday on turkey. Wow, This is a sick theme. I just checked with all browsers and everything running smooth. Good job Nick. It was great, this is Wp theme for the photographers do their own photo blog, I am working in bridal array will cover this theme for those of you making my photographer. Guys, this site keeps getting better. You know what. I’ve started to create sites based on what your coming up as opposed to finding the best theme for my sites. NICE!! Have been following your templates from the first one, but first now I joined since I might have use for this nice theme! Anyway, I just wish that the PSD was given sliced. It would be easier to change colors …. I just set up a photo “portfolio” using WP and “Yet Another Photoblog” plugin. Style.css in the archive is for PureType. Not that it matters, except it’s a little confusing when trying to find is in the wp admin themes list. Oops, I changed it. Thanks for letting me know. wow, as a wannabe photo without a site you just gave me a reason to put one up. Thanks a whole lotta bunches. hmm, wheres the blog layout and like the normal layout option? One other thing, the Featured Article information is not in the ePhoto FAQ. I figured it out from the PureType readme, but you might want to keep that all together. this theme version is using TimThumb PHP Script that will allows you to customize sized version of an image and will produce a cropped. The featured section of this theme whose thumbnail images are set to a limit size of “h=364px and w=655px”. Any images whose dimensions below to the set limit will produced a tile image result. I can see that. What I’m asking is if any thought had been given for accommodating photos that are h=655px and w=364px. This is a beautiful template, but if it only supports photos that have a horizontal (landscape) orientation, it’s not particularly useful to me (or a lot of other photographers). Wow, stunning work! Very impressive. great theme, I like it and i have add it to my blog. God only knows how I got to this website. big the web really is. Wonderful!!! I’ve been waiting for something like this. It is awesome. Thank you! this really is BEAUTIFULL !!!!!!!! I just loooooove it, great work !! it’s such a joy to have registered for such a high quality service, you really do a great job, please keep on like this !! Great design and I especially like having the “blog” as well as the photo categories. I already have a website that will benefit greatly from this superb theme. just the thing i needed for my photogallery with blog features! The amount of value you offer is amazing. There is at least on other dude like you in the community. Just blown away by the quality of this latest release. Another great one – you always manage to provide different ideas, beautiful designs and high quality! Congrats and thanks! For instance, I’m really psyched to use your theme at http://blogs.courierpostonline.com/vu/ but much as I try to adapt it to use get-the-image, it’s challenging, since the two plugins work so differently. Can’t wait til either get-the-image becomes the WP standard or timthumb is adapted fro MU. You keep amazing me with the beautiful themes you put together. Can I integrated HD video in the theme ?? exactly my thoughts. A multimedia theme which can showcase images/flash/videos simultaneously would be awesome. There is one. I made it based on this one. You can see it in action @ http://www.simplethoughtproductions.com and download it in the ePhoto section of the forum here. Please include a white/light grey style as well. This is an excellent theme man. I only wish it could handle animated media (Flash/Videos) as well. Is it possible? or can you work out something which could handle all kind of media. A Multimedia theme? Sorry, in my previous comment the editor has removed a tag I was talking about… I publish the post again to make the meaning clear. If you want to remove the previous comment, go on! I’ve searched for a long time a good photo theme and none has ever satisfied me. Even when the design was good, there were problem with the theme customization and configuration. With your themes I know I won’t have any problem, I’ve already produced some websites with your themes and, after an initial setup to make them compatible with plugins and customers requests, they work smoothly. Thanks again for you wonderful work! 🙂 LOL! the tag keeps vanishing! your last few themes have been some of the greatest available for WordPress. Your work gets better and better. Congrats. This one shows a more professional eye. eBiz has a few unfortunate corners. Everything here is streamlines. Well done. Very cool theme! just downloaded! This theme is one of the reasons why its practical to buy premium themes! I’m proud to be an affiliate! keep it up! Great, great job on this theme! You’ve done a tremendous job in making WP not look like a typical WP site! If I browse by tag, category or search result, I only get the thumbnails as a result set. So, if someone clicks on a tag that is specific to a blog and not a photo, they will only get the resulting thumbnail (if there is one). I know this theme caters heavily to photos/images, but it would be nice to have the option for results to be listed with the title in addition to the thumbnail. Or have the option to view the result set in a list view. This way, navigating the blog portion of the site is more manageable. Excellent work. I am very impressed by the design and functionality you put into your themes! Very cool! Affiliate and I’m getting a good result with this. Enjoy this beautiful theme. It not downloading for me. Is the file corrupted? Try again, it should be working now. Sorry about that. ohu, I really love this template, but I have a blogspot account. can you create a blogspot version? pleaseee! Wonderful theme, as expected from a talented designer. I’m using this theme on my newest project/blog – FreelancerFire. I’ve modified the style sheet and color slightly to match my firey theme, and plan to mod it even more in the days to come. I’ll also be sending you an email shortly about your opening for someone to help out in the forums. I am not a web designer, but you did a great job of altering this theme to your needs. Please use the support forum for tech support, I need more info, such as your URL. The theme is not good. The latest version of the theme has been updated with a fix for this problem. For the price of a year and half membership at eleganttheme, I purchased a forest that sells themes (I won’t name it ). It was pretty on the outside but extremely sloppy on the inside requiring manually changing PHP code to customize. Lesson learned. I’m sticking with a few quality theme sites from people I trust, like Nick. Sorry, got it to work. My mistake. Great theme. Thanks!! Wow! You made so many people happy with this Theme, great job! I LOVE this!!! Perfect for my layouts site that I need to redo. Thank you!!! Im in Love with your themes,You are extremely talented and an asset to the Design world and WordPress users! Keep designing as Im now an official Elegant Theme Groupie and totally addicted! hi i am newbie for wp. and this theme is great! hi are you there, please tell me how to do, thanks! how to display the thumbnail? still waiting for your reply…. Please use the support forum for tech support issues. I need more information to answer your question, such as your URL. 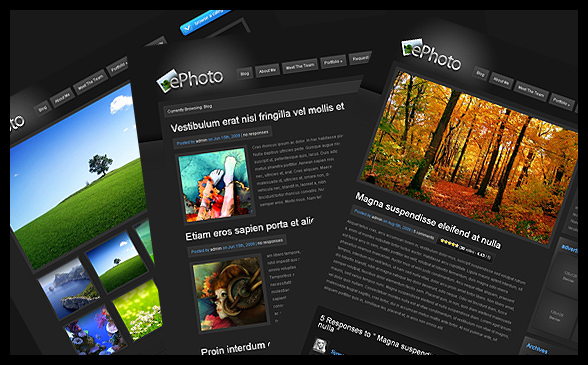 I was very grateful to see such a beautiful photo theme for WordPress in elegantthemes. Of course it would be nice to see how the demo site looks from the admin because what little documentation there is for the template fails to give a clear path for creating a gallery. After a few hours I figured out a big part of the puzzle but those hours could have been saved with a few clear lines of instruction. i tried the theme but , pictures thumbnail didint show on homepage. Please use the support forum for tech support issues. I need more info, such as your URL. Just i want to try the theme, if i like i will bu it. Please help me about the thumbnail problem..
i use free host an i connect my host name and the free host. is it a problem for the theme? Hi, great work on the theme. I like it. I’m considering getting an account with you, but I want to know if your themes can be made to work easily with flickr or smugmug to stream the images from? Do they work with a simple url or do they have to be local to the website? Also, does this theme support video (again streaming offsite)? First of all: Great looking theme. But nevertheless I can’t use it. As I have many photos in portrait orientation, these images don’t look good in the slider (carousel) on the frontpage and on the single image page as they are being tiled. In the demo gallery only landscape images are used, and there’s no problem with them. Everything’s looking great. Fanastic theme but i want to know if there is user guide or help of how customize this theme and how add photos and so on !!!!!!!! The first thing you should do is read the readme file that came with the theme, as this includes installation instructions. If you have further questions please post them on the support forums. Having issues with the images on the front page they wont apear. I tried to post with a image nothing came up. Can someone give me a tutorial on how to place images on the root please. Please refer to the tutorials section in the member’s area for detailed video-instructions on how to add thumbnails. If you still have questions you can post them in the forums, I can’t provide support via blog comments. Love your designs, especially this one. I am a complete newbie, yet to setup my first WP blog and theme. I want a theme with enough built in admin controls that I don’t need to spend time learning coding tricks and tweaks. Unfortunately I can’t find anywhere exactly what your admin control panels will do, just a general statement of ‘ePhoto comes with an options page that features a long list of settings that makes managing the theme as user-friendly as possible.’ And unfortunately unless I join I cannot access the forums to find out more either. Is there more info anywhere I have missed? I would like to know exactly what I am buying before I buy it. Oh! Great work!! The best theme WP for Photografer. If you are have troubles please use the support forum. I cannot give adequate support via blog comments. All you really need is the latest version of WordPress to use the themes. Everything else is provided. Please open a thread on the support forum. I do not provide tech support via blog comments. Couldn’t see any positive response to the issue of portrait orientation images. How are they handled and will they destroy the beautiful layout? That concern is all that’s holding me back from becoming a subscriber. Actually the fact that my two presales questions have been ignored is also holding me back from joining. If you can’t get help when you’re trying to buy there’s even less chance you will get it after somebody has your money. When I join… and it’s getting pretty close now, I’m going to set up my site using eBusiness. That’s because I want it to look like a website not a blog and I want to get involved with CMS. But if I ever need a photo blog… this has to be the one that I’ll choose. Great theme, but the theme options wil not work at me. I see the links, homepage, blog setup, manage ads and more. But if i click on de link, only de page reload, but see nothing to change the settings. hello coul you help me with the about me box. how do i edit it. i wanted to have an about me section and thought it would be nice to keep it right where it is but i dont know how to edit it or remove it? please help me. If you need assistance please start a thread in the support forums where we have people waiting to assist you. I am so excited to finish my new website! This theme is turning out perfect for my work. I just wanted to say thank you for creating an awesome theme and your video tutorials are great for novices like me. I am very impressed! hi , i have a question and hope you can help me , i also have ephoto theme , but i dont know how i can put text beside my photo’s in the slider , i mean on the right side , do you know how to do this ? How beautiful your themes is! I’m a Chinese,I can’t say English well,please understand. Will this theme work for a modeling site? Different galleries for each model? Hard to say without a trial but it looks really good. I’m trying to help my brother with his website and can’t seem to find the image name for the main picture, to upload. I’m not particularly web savvy, but I imagined it would be a lot simpler to upload pictures. I uploaded a logo, but can you tell me how to upload a main picture? I’ve managed to upload it into the thumbnails..but the main image box is empty…have you figured it out??? I got this theme awhile ago….and I’m Curious…I was never able to figure out how to use the image slider on the main page. I would post something and the image would appear in the thumbnail at the bottom…but the main slider box remained empty. Any idea why? I ended up using a different theme from somwhere else. But, I still would like to revert back to the ephoto. Hi! I liked this theme. But I have a question – how do I make the Page Navi work on the home.php? On your preview you have navi on your home page. I just came from looking for a good site on Bing and came across yours. I have to say these templates are great. Thanks for mentioning them in your blog. I will be sure to add this to my favorites. how to insert images in featured slider in ephoto please help!!!!!!!!! This theme is great and exactly what I was looking for. I’m having trouble getting the About Me section to show up however. I can’t seem to find where to input the text and photo for it show up on the home page. If anyone has any suggestions on how to make this work, I’d really appreciate it. Yes, this theme is really nice for photographers but..but..we can’t put a photo in portrait orientation ! Yes, i know there’s a topic where customers (!!) are solved this issue but it’s very difficult to understand this technic language in english for an french guy like me (and not a super geek). We all know that Ephoto and deepfocus have problems with the photos size and portrait orientation..and we also know that photographers don’t shoot only landscapes !!! And i post here because..no answer on the forum ! ePhoto is compatible with IE9 ?! I have a stupid question. How did you do the post thumbnail to open in full size? Thanks for the beautiful theme! I’m using the same theme for my blog.. 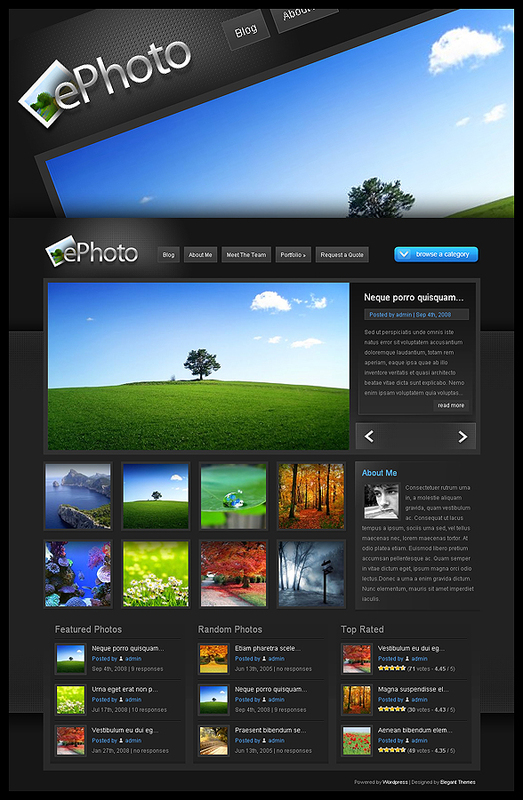 Very good theme WP for Photography. That’s a great theme, i’ll try it ! We are photographer, your wordpress theme is a great choice for our wedding studio. We will review the considerations used for the next version of the website. Thanks for the great things from your beautiful website interface gives me. When I install your theme on my new website, everything is pushed to the left side and no black background. The funny thing is when I installed this on my other webiste, it works fine. If you need help, please open a thread in our support forms so that our tech support team can assist you. it’s possible put in the home (under the slide) a description (about us) instead of showing the pictures? How can I do?